The Russian Navy is expected to deploy over 30 ‘Poseidon’ nuclear-capable unmanned underwater vehicles (UUVs), a source told TASS news agency on January 12. Two Poseidon-carrying submarines are slated to enter service with the Russian Northern Fleet while the other two will join Russia’s Pacific Fleet. Each submarine will be capable of carrying up to eight UUVs. Consequently, a total of 32 Poseidon UUVs could enter service with the Russian Navy in the coming years. “Two Poseidon-carrying submarines are expected to enter service with the Northern Fleet and the other two will join the Pacific Fleet,” the source told TASS news agency on January 12. “Each of the submarines will carry a maximum of eight drones and, therefore, the total number of Poseidons on combat duty may reach 32 vehicles.” The Russian Ministry of Defense (MoD) has neither publicly commented nor confirmed the exact number of Poseidon UUVs to be inducted into service. Russia purportedly commenced sea trials of the Poseidon in December 2018. The ongoing tests are part of experimental design work rather than full-fledged sea trials, according to a Russian defense industry source. Russia’s MoD already announced in July that sea trials, primarily focused on the UUV’s guidance system and underwater operations in autonomous mode, were under way. The underwater tests are likely carried out by a B-90 Sarov-class Project 20120 diesel-electric submarine, which serves as the launch platform for the UUV. There are still questions whether Russia will be capable of building a reliable miniaturized nuclear reactor for the UUV [next to other technical challenges]. The drone is listed in Russia’s state armament program for 2018-2027 and is expected to be delivered to the Russian military in the late 2020s. However, the ‘Poseidon’ UUV will likely not move beyond the prototype stage as it appears to have been designed primarily for negotiation purposes for future strategic arms reduction talks with the United States and NATO. It is also remains unclear whether the Poseidon UUV, if operationalized, will only serve as a nuclear-warhead delivery platform or could be used for other purposes including intelligence, surveillance, and reconnaissance (ISR) missions. Business insider explained the real purpose of Russia’s 100-megaton underwater nuclear doomsday device. Since 2015, when images of a Russian nuclear torpedo first leaked on state television, the world has asked itself why Moscow would build a weapon that could end all life on Earth. While all nuclear weapons can kill thousands in the blink of an eye and leave radiation poisoning the environment for years to come, Russia’s new doomsday device, called “Poseidon,” takes steps to maximize this effect. If the US fired one of its Minutemen III nuclear weapons at a target, it would detonate in the air above the target and rely on the blast’s incredible downward pressure to crush it. The fireball from the nuke may not even touch the ground, and the only radiation would come from the bomb itself and any dust particles swept up in the explosion, Stephen Schwartz, the author of “Atomic Audit,” previously told Business Insider.But Russia’s Poseidon is said to use a warhead many times as strong, perhaps even as strong as the largest bomb ever detonated. Additionally, it’s designed to come into direct contact with water, marine animals, and the ocean floor, kicking up a radioactive tsunami that could spread deadly radiation over hundreds of thousands of miles of land and sea and render it uninhabitable for decades. In short, while most nuclear weapons can end a city, Russia’s Poseidon could end a continent. 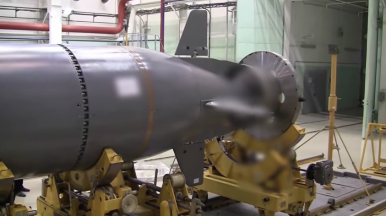 Russia’s “Poseidon” Nuclear Torpedo: Are We on the Verge of Nuclear War? The goal of the Russian unmanned underwater vehicle Poseidon is to cause NATO to collapse, Western experts believe. According to them, most nuclear weapons can destroy one city in a nuclear attack. However, the new Russian torpedoes can wipe away a whole continent. In the United States, they fear that coastal waters can be exposed to radiation from the Russian torpedoes for many years to come. Western experts wonder whether it is expedient to save Estonia from Moscow’s tight grip as long as Russia is allegedly going to use Poseidon torpedoes as insurance, while dismantling NATO. Russian experts have reacted with saying that such an assumption is strange, to say the least, because it is impossible to destroy such a powerful organization as NATO only by the presence of a certain type of weapon. The Poseidon does raise many eyebrows in the West, but it is ridiculous to assume that Russia is willing to destroy continents and kill hundreds of millions of innocent people by starting a nuclear war. For many years, Russian military strategy has been based on principles of containment, while all types of weapons of the Russian armed forces were made to defend Russia from invasion. The Poseidon torpedo is also a weapon of containment rather than assault.